In January 2017 we switched Internet hosts and moved our blog to being our home page. Over time we will be reassembling our earlier content into the blog as posts. We plan to once again actively cover the interesting world of Virtual Pets. Larry Dignan and Tom Steinert-Threlkeld’s Between the Lines blog on ZDNET had a posting today titled, Virtual World Tipping Point: Is there an Enterprise Use?, They point out Google’s recent entry (Lively introduced yesterday), Second Life’s quick rise to success, and IBM is working with their own virtual world engine designed for corporate use. They also point out IBM and Linden Labs announced yesterday they have successfully moved an avatar from Second Life to an Open Sim server. As virtual worlds gain more traction, and the ability to interact with other virtual worlds, we may see more business meetings being held in virtual environments. Here at Virtual Pets Blog, we think that is a given. Fuel and transportation costs are significantly impacting nonprofits, churches, and organizations. We expect them to lead the pack. Yes, we know many of these organizations already have a presence in Virtual Worlds, but much of the current presence is to recruit “real” members, seek donations, or to raise the awareness of their cause. In the future, we expect them to also be holding their business, leadership, training, and organizational meetings there to save fuel and travel time. One place this could rapidly come on the scene is organizations with several young families in rural America where distances are large, and the younger generation is comfortable with the virtual platform. “Fans Resist End of Virtual Disneyland.” Wall Street Journal. 20 May 2008. Page B1. Reports Disney’s Virtual Magic Kingdom launched in 2005 as part of the 50th anniversary of Disneyland. The free game allowed users to create avatars and explore an interactive version of Disneyland. Now Disney wants to pull the plug. Some think to run users over to similar Disney sites requiring users to pay, like Club Penguin and ToonTown. Users are mixing real and imaginary efforts to attempt to stop the closing of their beloved park. “South Korea’s Nexon Paves Way in Selling Virtual Gear for Free Games.” Wall Street Journal. 23 May 2008.Â Page B1. Reports Nexon Holdings is doing great in Korea with a free game called Kart Rider, The game is free, but users pay to customize vehicles and their avatars. Later this year, Nexon plans to release “Sugar Rush” in the United States. It uses a similar model (free game and pay for accessories) in which users compete to gobble up virtual coins. Nexon prepaid cards (for purchasing accessories in their existing games) are currently said to be the second best selling entertainment gift card at U.S. Target stores, behind Apple iTunes cards. Maple Story, an online role playing game for teenagers, is currently Nexon’s leading entry in the U.S. market. Nexon’s success with a twist on the old razor model where you give away the razor to get the customer to buy blades from you, now has many other game publishers considering getting a shave. Disney previously launched a site young girls could use to build their own Fairy (DisneyFairies.com). Since then over 4.5 million fairy avatars have been built. Per a 19 Feb 2008 press release, Disney is now in process of opening an online world called Pixie Hollow (PixieHollow.com) in which young girls can actually fly around as their fairy avatar. Two types of charm bracelets and some charms will allow real world interactions to be replicated online. A magic jewelry case (with a USB port to your computer) “reads” your charm bracelet. The special charms are then replicated in the online world. A great feature is the ability to touch your bracelet to your friend’s bracelet and push the “friend button”. Now the next time you put your bracelet in your magic jewelry box, you and your friend’s avatars become friends online as well. Another accessory is a handheld game that can be used to gain “points” for use in the online world. Techno Source calls the interactive technology used in the game components (charms, bracelets, jewelry box) “Clickables”. Disney has nice Tinkerbell sounding names for them: Pixie Dust Jewelry Collection, Tink Friendship eBracelets (includes the Friendship feature), Tink’s eCharm Bracelet,Â Fairy eCharms, Tink and Friends Fly with me eLCD game. A nice image of them is available on GadgetsGizmo’s. As we understand it, communication online will be accomplished by selecting phrases (similar to Barbie Girls) or typed text with a filter. Combined with great graphics, several games, interactive areas, and the Disney brand, this site may pull more young girls online, as well as pull them over from competitive virtual worlds. It looks like a great application and we wish them well. If this technology (“Clickables”) follows form with other interactive devices, we may soon see “Fairy Hackers” figuring out how to get the bracelets, charms, and jewelry box to do additional tricks? (Hack Furby, Hack Aibo, Hack Tamagotchi, Hack Roomba, etc.). Will the Dark Side use Pixie Hollow? – it will be interesting to see if auxiliary applications spring up outside the game to use the interactivity (using the verification of the charms, the bracelets, etc) inside the game. For example, the ability to pass previously coded messages (such as “I like your hair” means “put $100 on Seabiscuit in the 6th”) between two authenticated avatars. This communication channel might be utilized by everybody from computer hackers to terrorists. Not exactly Disney’s intentions.Â But that is true of most technologies. They can be used for good or for evil. Let’s all promise to use this one for good! In terms of future applications, Disney has already said they are looking at “Clickables” in Club Penguin. We anticipate other virtual worlds to follow, especially because it is a way to monetize virtual worlds (sell bracelets, charms, collectibles) that have both “real world” and “virtual world” uses. Plus when those objects are worn in public, people ask about them, and even more are led to their online world. “Cheer Up, Ben: Your Economy Isn’t As Bad As This One” Wall Street Journal. 23 January 2008. Page A1. Not only are real banks struggling withÂ sub-prime mortgage problems, Second Life is shutting down virtual banks that were failing to deliver high returns they had promised their depositors. All virtual banks (about a dozen) were closed. Many players convert actual dollars into “Linden dollars” to deposit in their virtual bank accounts and use in the game. Some virtual banks have done well, others have lost money in land and gambling deals. Under the new rules, only chartered banks will be allowed. A virtual run on the banks left many players unable to get their money. The Journal reports a previous run on a virtual bank in August may have cost players $750,000 in real money. Linden announce yesterday’s shutdown two weeks ago. Players started coming into the banks to withdraw their money. Some banks shutdown their virtual ATMs. “Linden essentially acknowledges that the financial services being offered in its virtual society have evolved to the point that they need to be regulated by the real world. ” From now on those accepting deposits inside Second Life will have to have a real government registration statement or financial institution charter. Many other reports covered the bank closings in Second Life. Some report Ginko Financial is the virtual bank that failed back in August in a virtual ponzi scheme. Others point out the increasing parallels with the real world such as the possibility ofÂ being charged with a real crime for your actions there, and the recent run on the banks. Some say it is getting to real to be an escape from reality. “Start-Up to Create Market for Trade of Virtual Goods” published 17 December 2007 in the Wall Street Journal reports Live Gamer, Inc. is developing a safer way to trade virtual goods. They will only allow trading of items with the “blessing” of game publishers and are currently working with Funcom GmbH (Sony’s online group), PingO Interactive, Ltd and others. Current markets have been fraught with fraud. Gold farmers (those who collect virtual goods for resale, often from swarms of poorly paid employees playing the games in China) are a problem. In addition to real social issues, they create virtual social issues as they play the game because they focus entirely upon gaining wealth and minimally interact with other players. Some purist believe players should earn their tools by playing the game, not by purchasing them. Live Gamer will be announcing today that it has raised $24 million from Charles River Ventures, Kodiak Venture Partners, and Pequot Ventures to fund the launch. Live Gamer says it has promised publishers it will prevent the sale of items by gold farmers, however the article is not specific on how that will be accomplished. They do say the seller of virtual goods will get 90 percent of the sale, and the remaining 10 percent will be split between Live Gamer and the publisher (details of that split not specified in the article). Our thoughts – maybe we will see virtual game leagues in the future similar to Drug Free Power Lifting Organizations and non tested Power Lifting Associations a few years ago (Pure leagues and Buy Your Stuff Leagues). Wonder how long it will be till we have a parallel to the virtual drug test (way to tell if you earned your tools or bought them?). Back on 21 June 2007 Ugobe launched PleoWorld.com to continue ramping up interest for their interactive dinosaur to be released late this year. 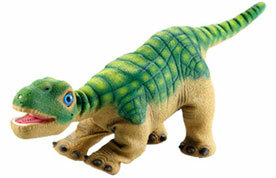 Pleo is a realistic robotic dinosaur that will evolve through life stages and and develop a unique personality based on your interaction with him. He is modeled after a one week old Camarasaurus sauropod, or long necked dinosaur and incorporates the basic traits of artificial life. He expresses his emotions through his actions and sounds. Pleo includes two 32 bit microprocessors for central and image processing, four 8 bit subprocessors for motor control, 14 motors, over 100 gears, infrared and camera based vision, two microphones for hearing, eight skin sensors, four feet switches, fourteen force feedback sensors, a tilt sensor and an infrared mouth sensor (for food detection). He also includes a mini USB port and as SD card slot (for add ons), and an infrared transceiver. “First Hatch” 30 Day Shipment Notices were sent out to pre-orders on 8 November 2007, so Pleo is expected to be on the street, at least in limited numbers quite soon. Amazon is taking orders for sale right now for a December 18th release.